While cleaning through some old files on my laptop [aka, procrastinating on homework], I stumbled upon the speech I gave at my best friend’s wedding back in March. She and her husband moved to Texas a few weeks back and I’ve been pretty melancholic about it, as I had become pretty accustomed to having my closest girlfriend just five minutes from the house. Both of our lives have gotten very busy, making it hard for us to reconnect except for a few text messages and Facebook pokes now and then. However, in rediscovering this speech this evening, I’m reminded of the fact that our friendship goes far beyond the traditional definition. Delonna is a huge part of my life and no amount of physical distance can truly change that. She is my confidant, my ally, and my rock. I don’t care if she’s 1,000 miles away — it just means I’m going to get an opportunity to practice my penmanship and send her cards in the mail! Nearly four years ago, Delonna and I were introduced on a sunny day at the beach. My initial impression was that she was one of the most beautiful girls I’d ever seen. Naturally, I wanted to hate her. Fortunately, that’s a physical impossibility. The more I spoke to Delonna, the more I wanted to get to know her. We became gym buddies initially, bonding over sweat, UCF horror stories, and sharing love advice. Over the last four years, our friendship has grown to a point that is beyond definition for me. She is one of the most caring, generous, and kind-natured people I’ve ever known. She has become the best friend I could have wanted… the little sister I never knew I needed. She has been a rock for me, unwavering in her love, support, maturity, and guidance. In watching my best friend grow, I also had the unique pleasure of watching her relationship with Gerard. It blossomed from high school puppy love, to college romance, and it evolved into the deep love that we celebrate here today. They grew together, despite obstacles and trials, and came through the journey of their youth in a bond stronger than before. Gerard, you are the luckiest man on Earth – second to my husband, of course. Delonna is beautiful, inside and out, and Gerard – you are her equal. You love her the way she deserves to be loved; you respect her insight, her intelligence, and her quirks, and somehow, she puts up with you, too. So it all works out. For which many have sought. Today is just the start! And may love always guide your way! 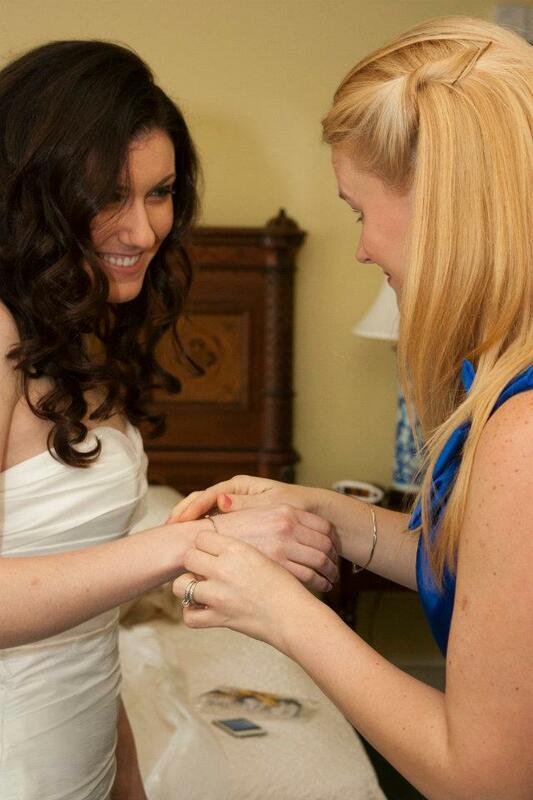 Giving Delonna her “something borrowed” just before the wedding – the bracelet my father gave me the Christmas before he passed away. ← Second publication in a week – I’ll take it!